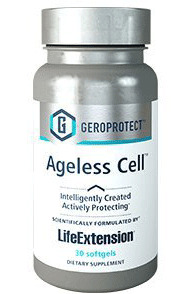 Ageless Cell is designed to inhibit cellular senescence, a natural part of the aging process. Ageless Cell helps rejuvenate near-senescent cells and encourages the body's healthy process. In partnership with Insilico Medicine, Inc.
Other ingredients: medium chain triglycerides, gelatin, glycerin, beeswax, palm oil, purified water, sunflower lecithin, mica, ferric oxide. Tocotrienols are extracted and concentrated from sustainably sourced Malaysian red palm oil. Dosage and Use: Take one (1) softgel daily with or without food, or as recommended by a healthcare practitioner.